Furonious dragged Timtam into the Lionette’s bedroom and shoved her onto the floor. “Take off your clothes slave” he demanded. Timtam rubbed her wrist and looked at the floor. She had to think of something fast. Her heart was racing. Why was he doing this? Timtam undid the clasp behind her neck and let her outfit slip off of her shoulders. Furonious lifted her to her feet by her hair. “All the way.” he commanded. Timtam pulled the outfit down and let it drop to the floor. She tried to cover herself with her hands but he smacked them away. Furonious stood at least a foot taller than Timtam and out weighed her by over a hundred pounds ,she was at his mercy. She wanted to say something but she knew it would just make him angrier if she did. Timtam just looked down and shook her head. “It’s because I’m on to you slaves. I see how you have my sister fooled. My sister let you know about my fathers death and held it back from me. My own sister trusts you more than me! She thinks you can be trusted. She thinks you like her and are happy, but that’s all a lie isn’t it slave? None of you can be trusted. Well today I’ll teach you a lesson in trust. I’m going to do whatever I want to you and you won’t be able to tell anyone because nobody will take your word over mine. Even if they believe you they have to go along with it because I’m one of them.” He said as he dragged her over to the bed. Cheena had been looking for Timtam for over two hours now. She was getting angry because no body knew where she had gone. Cheena had knocked on the door to Lionette’s quarters but the door was locked and there was no answer. She had seen Furonious about half an hour ago but he said he hadn’t seen her either. Cheena wasn’t sure if everything was alright or not. Lionette had left such cryptic instructions that she wasn’t sure what to think about the missing slave. She decided to go back and use her emergency pass code to access Lionette’s quarters. Cheena asked two guards to accompany her into the room, there still may be assassins in the palace. She opened the door to the quarters and let one of the guards go in first. The lights were off but the windows to the balcony were open. A soft breeze was blowing the silken curtains gently. There wasn’t a sound in the room at all. There was a feeling that something bad had happened in this place but everything looked alright. “In here Mistress!” one of the guards said as he looked into the bed chambers. The bedclothes had been torn off and were hanging haphazardly from the bed. The mattress was cocked at an angle as if moved by some force. A few tiny bed side objects had been knocked to the floor. Cheena could now hear the shower running in the next room. She pushed past the guards and into the bathroom door way. The room was foggy from hot water. The shower must have been on for quite some time to cause the room to be this steamed up. Cheena could see a body in the corner of the shower. She moved closer to it and saw it was Timtam. She wasn’t moving at all and she feared the worse. “Timtam?” she said gently as she reached out to touch her shoulder. With a great deal of relief she saw Timtam look up at her slowly. She had been beaten and worse. She had a bruise on her cheek and some blood coming from her nose. Cheena quickly stood and turned to the guards. “Say nothing of this! Do you understand? Nothing!” she said forcefully. She helped Timtam up and set her on the chair by the mirror. “Wait in the hall way please.” she said to the guards. The two men went and waited outside the room as commanded. “Who did this to you Timtam?” Cheena asked as she carefully dried her off. Timtam looked dazed and was almost in a state of shock. “Who was in here? Was it one of the assassins? Please Timtam, It’s very important.” Cheena took hold of Timtam’s shoulders and looked her in the eyes. Cheena helped her up and walked her out to the bedroom. She began to have her lay on the bed but as she was doing so Timtam suddenly became wide eyed and pushed away from the bed. “No!” she suddenly cried and stumbled over and collapsed on the sofa. Cheena went to her and put her head on her shoulder. Timtam began to cry and hugged Cheena tightly. Cheena rocked Timtam back and forth comforting her. “Please Timtam I must know what happened, who did this?” she asked. Timtam new it would cause problems if she told. 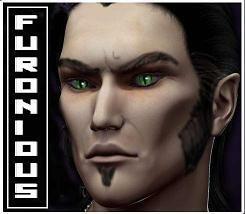 Furonious was right. No one would do anything about it any way. He left her there beaten and ravaged on the floor laughing and telling her no one would believe her. But she had proof. They always underestimated slaves. Timtam sat back on the sofa and took Cheena’s hand. “What is it Timtam, who was it? She asked. Timtam placed a small object in Cheena’s hand. She looked at it closely and turned to the light for a better look. It was a button from an officer’s coat. Not just any coat but the coat of an Admiral. It was from Furonious’s coat. Cheena turned quickly and looked at Timtam in shock. Timtam just nodded to confirm what Cheena wanted to ask but couldn’t. “Can you walk?” Cheena asked. Timtam sat up and nodded yes again. Cheena quickly went to the closet and found a long hooded dressing gown that belonged to Lionette. She brought it to Timtam and helped her put it on. “I’m going to take care of you now Timtam. You must be silent and come with me.” Cheena said. They walked to a large column in the center of the room. She pushed a secret panel and it opened to a stairway going down. The two women followed the passage until they came to a second stairway. They went up and came out of a similar column in Cheena’s quarters. “You will be safe here Timtam, I’ll make sure of that.” she said reassuringly. “Thank you Mistress.” Timtam said still half dazed. “Now you must listen to me Timtam, do you understand what I’m saying?” Cheena gently lifted Timtams head with her hand until they were looking into each others eyes. “You must never tell any one what happened especially Lionette. It would mean that she would have to choose between you and her brother and she would have to choose him. Your only option is to say nothing and let me take care of this. Will you keep silent and put your trust in me?” Cheena asked. Cheena had always been kind to Timtam and never even raised her voice to her or any other slave. It was still strange that she would even consider that what Furonious did was wrong. It was his right as a freeborn to do as he wished with her. He did push his rights to the limit however by beating her to the point of bruises and blood but it was still within legal limits. The only other thing he did wrong was use Lionette’s property without her permission. There was something more to her purpose that she wasn’t saying. Timtam did want him to pay for what he did so she agreed. “Yes Mistress, I will be silent.” Timtam said. “ Then it’s all settled, you’ll let me take care of everything.” Cheena smiled and gave Timtam a hug. The hug was the most unusual part of the whole conversation. Why would a free born royal care enough to touch or even hug a slave? Timtam had spent the next day recuperating in Cheena’s quarters. She slept most of the time due to a relaxing tea that Cheena had given her. Cheena had told her that she had sneaked back and straightened up Lionette’s room as if nothing had happened. She would stay with Cheena until Lionette’s return. That night Timtam was awakened by some low voices in the next room. She noticed that her tea cup was empty and wanted some more to help her sleep. Cheena must have had some guests so Timtam thought she would see if they needed anything. Still half asleep she thought she heard one of them say Drethas. He was the one that she had secretly made love to and he had also tried to kill Lionette. She stopped at the door and set the cup down on a table by the door and listened. “Yes Drethas loved Timtam but he should have listened to us and waited. We must act together and not separately no matter what the reason. We all agree this injustice has gone on far to long. Since the truth of our origins has been discovered we must do what is necessary as true Feloids and do the right thing. Our leader has taken the first step and shown incredible courage by having her own father killed. It is our sacred duty to uncover the lies of our origins and put our culture on the correct path.” said a male voice. “It was the hardest thing I have ever had to do as you must all be aware. But it had to be done if I am to become a Clan leader. Our brothers and sisters that we hold in slavery must be able to share in our culture and all it offers. Their ancestors had been enslaved for reasons long past and forgotten. It is time we joined the rest of the enlightened Galaxy and freed our slaves.” said Cheena. Ever since the ancient records were discovered in that old library on Ty Prime it has been a sign. A new beginning and a way to set things right. We should be proud to be the ones that will end centuries of lies and oppression.”Cheena added. “We must also remember our human brothers and sisters in the Empire that lead us to the ancient records that have set us on the true path. In a short time we will be able to get the aid we need from the Emperor and wipe clean our stagnant culture and replace it with one that replaces the isolationist ways of our past.” added a second female voice. Timtam couldn’t believe what she was hearing. Cheena and these others were in league with the Empire and had Maxis Ty murdered. Timtam had never been so frightened in her life. She was now the only person not in the next room to know the truth. If they ever suspected she knew she would be killed. “The fact that our ancestors were hybrids of human and animal origins is to me a wonderful thing. Our human creators have given the Galaxy the Feloids, a magnificent race of proud people. It is time everyone knew the truth and if there must be violence to make this happen then there must be violence. Too long have the ones we have considered lesser than us suffered at the hands of Free borns. We must change this once and for all.” Cheena said to the others. Timtam was in shock. She was in the middle off a group that was set to bring down their entire culture and set in place a new order backed by the Empire. To make things worse these people may be right! They wanted to free all the slaves and open Feloid space to the rest of the Galaxy. She didn’t understand some of the things they were talking about but she knew Cheena was always kind to the slaves. “ We must now come to a decision about what to do with the others. It is not for me to say as they are my family. I must leave their fates up to you so you may see my commitment to our cause.” Cheena was now disguising the lives of Lionette, Mundis, and Furonious and what would be their fate in the new order. “For you to claim unquestioned Clan Leadership then Lionette and Mundis must be removed permanently. Of course Furonious would have to go as well. They must all be killed.” said the female voice. “Agreed.” said Cheena without emotion. Timtam crept back to bed as quietly as she could. She couldn’t stand to hear any more. They were talking about murdering her own family as if it meant nothing to them. Timtam was confused. These people wanted to help the slaves but it would cost thousands and thousands of lives to do it. She knew it would mean civil war and only she knew about it. She quietly climbed back into bed and pulled the covers up to her chin. She thought about Pep and how she was free and the other girls that Pep had set free. What would it be like to be free? Maybe she could find a good man like Pep did. But for that to happen she would have to let Lionette be killed. Lionette was like a big sister to her. They were slave and master but she was safe under Lionette’s care and wanted for almost nothing. No! She had to tell Lionette but that would mean Cheena would be put to death. What if Cheena denied the whole thing? They would never believe her over Cheena. Why must the Free Born cause so many problems for the slaves? Timtam lay awake all night. She never really thought about being free. It was never an option before now. Not only her but all the slaves would be free. What would that mean? How would they survive? Who would feed them who would give them shelter. It was all too big of an idea for her to figure out. She would have to tell someone else. Someone that was wise and not a Feloid. She would tell Adda. Adda would know what to do. She would tell Adda because she was smart and knew how to handle such things. Everything would be alright now, Adda would fix it. Timtam had been able to sleep until the next morning. When she awoke she went to grab the tea cup but it wasn’t there. She then remembered it was by the door where she had put it down. She quietly got out of bed and was about half way there when Cheena walked in. Timtam froze in her tracks. “Timtam? What are you doing out of bed?” Cheena asked. She was standing right next to the cup by the door. If she saw it it would tell her Timtam had been by that door last night during the conversation. It would mean she had heard what they had been talking about. Timtam did the only thing she could think of, she ran. She ran past Cheena and out of the room. She flung open the doors and ran smack into the guards in the hallway. “ Whoa slow down little one.” The guard said. Tintam looked over her shoulder and saw Cheena walking towards her. She was trapped. She ran back into the room and then behind the huge sofa. “Timtam, what is it? Are you alright? It’s me, Cheena.” she said as she put her hand out to her. Timtam saw her chance and ran back into the bed room and closed the door. She threw the bolt and locked it. Timtam grabbed the cup and quickly put it back on the night stand by the bed. ‘”Open the door Timtam, I won’t hurt you.” Cheena said as she knocked. Timtam slowly opened the door. “I’m sorry Mistress I was confused.” she said looking down. Timtam learned long ago that if you have to lie to some one don’t look them in the eye. “It’s alright the tea I gave you is a very strong sedative. Some times it will make people hear and see things that aren’t real. Like a dream that you believe was true.” Cheena said as she lead Timtam back to bed. “Have you heard any thing from my Mistress? “ Timtam asked. Timtam rolled on her side facing away from Cheena. She was still trying to avoid looking at her face to face. “No Mistress, I was asleep all night and only woke up just shortly before you came in.” Timtam lied. “My goodness your back is so tense.” Cheena said rubbing harder. Timtam laid still. She was afraid to move or speak. “ I think you need some more tea.” she patted Timtam on her shoulder and stood up. “I’ll bring you some soup, I just realized you haven’t eaten anything since yesterday. You do so much for my sister it feels good to do something back for you.” Cheena said as she walked out. Timtam sat up and put her head in her hands. Did she dream everything that happened last night? Was any of it real? No, it had to be real. She had put the cup by the door. She had to put it back on the night stand. But what if she was sleep walking and put it there by the door and heard the conversation in her mind as part of the dream. Now she didn’t know what to do. Was Cheena really capable of plotting to kill her whole family just to free slaves?Another thing struck Timtam, who were the others in the room last night with Cheena? All of these things were such large matters that she could barely understand them. Cheena had admitted to having people over and talking last night. Was she just imagining the conversation or did she really hear what they had said? In her state of mind she could have taken a perfectly normal conversation and twisted it into some thing awful. She would have to wait and see what happened next. As best she could tell Cheena didn’t suspect that she knew anything so for now she would keep silent and wait. Cheena was gone for a long time. At least it seemed that way to Timtam. When she finally came back she was carrying a tray with a bowl of soup and some more tea. She unfolded the legs from under the tray and put the tray in front of Timtam as she sat under the covers. Cheena sat on the edge of the bed and smiled. Timtam was not used to this kind of treatment at all. She just sat and looked at the tray of food and then at Cheena. “Go ahead, eat.” Cheena said. Timtam took the spoon and tasted the soup never taking her eyes off of Cheena. “ Can you keep a secret for me Timtam?” Cheena asked as she smoothed out her dress. Timtam kept eating as she nodded yes. “ The man that tried to kill Lionette and stabbed you was named Drethas. He was a long time friend of mine, did you know that?” Cheena asked smiling. Timtam’s eyes went wide and she froze completely in horror. “We talked about everything, and I do mean everything.” she smiled. Timtam’s hand began to shake spilling her soup. She looked around nervously for a quick escape route. “You know he loved you very much. He was a highly decorated officer, brave beyond belief but he loved a slave and threw it all away because of love.” Cheena stood up. “I know that you two had been together, he told me about it and how he had managed to be the one to take you to the summer house so he could be alone with you. He never told you that he fell in love with you the first time he saw you did he?” she asked. “He wanted to marry you and have a family but the way things are now that could never be. He decided the only way to have you was to kill Lionette so you would be sold. He had saved quite a bit of money for that day but you saved her life. He died thinking he had killed the woman he loved.” Cheena turned away. Timtam began to cry, why did it have to happen that way? “ It was a terrible tragedy. Two people that loved each other could not be allowed to be together because of some ancient laws and traditions. How many others do you know of that could not be together because of some traditions set in motion long before any of us were even born. My own brother is a monster that preys on your kind because those laws say he can treat other people differently. The laws allow him to do it!” Cheena slammed her hand on the nightstand. “I know you heard us talking last night. I looked at the security recordings from last night in this room while I got your soup.” Cheena said calmly. “The question in front of us now is simple. Will you report us too Lionette? I will not let any harm come to you if you do. You have suffered as a slave your whole life so I will not punish you for my lack of security. I’m sure you never wanted to hear what we did. My life is now in your hands.” Cheena said. Timtam didn’t know what to say. This was all too big for her to grasp. “You can’t kill Lionette. I won’t let you do that.” Timtam said shaking. “It must be done. I can’t make the changes that must happen unless I’m the Clan leader. There are others that think like me that will join our cause if I become a Clan leader. It must be done, I’ve already had my own father killed for this cause. I can’t take that back.” Cheena said. “I don’t care about all those things you talked about. I won’t let you kill my only friend. She takes care of me and I take care of her. I won’t let you hurt her. Find another way to do it.” Timtam said nervously. Cheena walked across the room to the window and looked out. “You must understand that there are millions of slaves in Feloid space that live and die by the command of people no better than they are. Like yourself they are told what to eat when to sleep who they must obey. There are thousands of men like my brother that abuse their female slaves daily even kill them and no one does anything about it. Isn’t it worth a few lives from the class that oppresses your brothers and sisters to put an end to it?” Cheena asked. “Not Lionette, Not her.” Timtam said pleading. “I can’t expect others to remove family members for this cause and not do it myself.” Cheena explained. “ If Lionette has to die for me to be free than I don’t want to be free. I don’t want anybody to die for me to be free.” Timtam said. “ No, I just don’t want him to hurt anyone any more. I want him to be happy and not so angry. He only hurts himself.” Timtam said. “ You want me to believe that you only want him to be happy after what he did to you?” Cheena said in disbelief. “He only did it because he thinks no one loves him. He is angry that he is an outsider in his own family. He thinks Lionette thinks more of me than him.” Timtam was trying to explain that he understood why he did it. She was more concerned about Furonious’s feelings than her own. Cheena didn’t know what to say. She was raised to believe the only way to fight force is with force. The system she hated must be destroyed by violence. She was so consumed with justice for the slaves she never asked them what they wanted or how they felt about it. She never considered that the slaves would not want a violent over throw. She didn’t take into account that they had been bred to be non-aggressive and almost never used violence. The Free Born lived in a world of revenge and vendettas but the slaves did not. Their anciesters were a warrior race and extremely violent. They had been genetically re-engineered to have the aggressiveness taken out of them. There had never been a slave revolt in over five hundred years. Could it be they had become happy being only slaves. She found herself understanding she was up to her neck in a cause she didn’t really understand. Was it possible for a group of people to be happy living under the rule of others? Was it possible that they had actually bred a completely submissive race of people that didn’t care how they were treated? Is that even possible to be happy as a lesser being, It would be like a pet or farm animal that was intelligent. An entire race of people that was satisfied with being less than any one else. “What have we done?” Cheena said aloud. She looked at Timtam as if for the first time. She saw someone that wanted to be a slave, that’s all she knew what to be. They hadn’t created a race of super beings as first intended they had created a race of lesser beings! People that wanted to be slaves! Millions of them happy to be beaten and abused. “What monstrous thing have we done? Cheena said looking away from Timtam. Timtam didn’t understand what Cheena was upset about. The slaves would do whatever they were told to do. If they were told to be free then they would be free. If they were told to remain slaves then they would do that too. Cheena walked over and sat down in a large chair and began looking out of the window. She had forgotten Timtam was in the room. She was realizing the error of her ways now. Surely others before her had thought about freeing the slaves but they didn’t because they understood what she had only now discovered. They could never be set free. They were completely incapable of competing in this Galaxy. They had no sense of aggression or the other emotions needed to to survive. They would only wind up serving someone else in order to get by. It would take a massive breeding and genetics program hundreds of years to breed those traits back into them. Timtam slowly got out of bed and went over to Cheena. She was sitting quietly in a big chair in front of the window. She had her face in her hands and seemed drained. “Can I get you anything Mistress?” Timtam asked. Cheena took her face out of her hands and looked at Timtam. In the middle of all of this all she wanted to do is serve Cheena. Nothing she had said meant anything to her. She was bred to serve and that is all she would ever be able to do. That is all any of them would be able to do. She wanted so much to do the right thing. She wanted to make things better but all she had done is align herself with the Empire and conspire to have her father killed. All this was done for people that did not want to be free. They were like a pet you didn’t have to put on a leash. A pet that was happy to stay in the yard and do what it was told. “Can you ask my servants to pack my things for a trip?” Cheena said to Timtam. “Yes Mistress, where shall I tell them you are going?” she asked. “I have no idea Timtam, I really have no idea where to go now.” Cheena said smiling with tears in her eyes. “I must go just the same, there is nothing else to do.” Timtam went into the outer chamber and gave the message to Cheena’s slaves. Cheena sat in the chair and listened as they began to run about getting things ready for the trip. It was if the queen insect had given a command and the hive and all the mindless drones went into action with all the thoughts of a mindless machine. She began to hate them. She destroyed her life for these mindless drones. “Timtam, come here please.” Cheena called. Timtam ran in and stood in front of the chair waiting for her next order. “ Oh thank you Mistress, I will keep this our secret but what will you do about freeing the slaves now ?” Timtam replied. “I think that is for the best Mistress, It seemed to be causing you a lot of problems.” Timtam said reassuringly. Cheena looked at Timtam and smiled. She envied Timtam’s ignorance at that moment. An hour later Cheena had gone. She didn’t tell anyone where she was going or when she would return. All anyone was able to find out was that she took a huge amount of money and only one slave with her. The only message she left was that no one should worry and she would make contact when she arrived at her destination. Timtam spent the next several days confining herself to Cheena’s quarters. She went back to Lionette’s quarters a few times to check on things but only used the secret tunnel. Cheena had done a passable job straitening up the room but she felt it needed touching up. It wasn’t until the second time she went back that she was able to go into the bedroom and the bathroom. She straightened up in the two rooms and made sure everything was where it should be. As she was leaving she caught a glance of herself in the mirror. She was able to get a good look at the bruise on her cheek. It wasn’t that bad. She was just glad the whole thing had worked out so well. Nobody had to get in trouble and even Cheena would feel better after her trip Timtam was sure. When Adda checked in on her she asked about her cheek. Timtam put her head down and said she was in Lionette’s personal shower and slipped. She said she would get into trouble if Lionette found out and asked Adda not to tell. Adda promised she wouldn’t mention it and laughed in spite of herself. She seemed so childlike at times it was amazing.